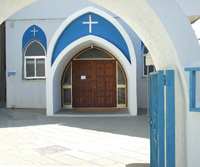 There are some lovely churches in Cyprus where you can choose to have a religious wedding. To limit your travelling expenses when visits to the church are necessary prior to your wedding, select to stay in the resort where your chosen church is. This very quaint church was originally built in the 12th Century and stands on the ancient site referred to as St Paul's Pillar. Aghia Kyriaki is a popular wedding venue for guests staying in and around Paphos. • Wedding ceremony • Marriage certificate. This imposing church is a well-known and beautiful wedding location within the grounds of the St George Hotel, located on the beachfront between Paphos and Coral Bay. St Barnabas Church is a lovely, traditional venue for your wedding. It is located in the old part of Limassol Town - don't be surprised to see the locals gather outside the church for a good look at the wedding party! St Close to the seafront of Limassol, the Roman Catholic church of St Catherine boasts a stunning interior. Nearby gardens provide good a good opportunity for the setting of your wedding photographs. St Helena offers an excellent location in town, yet it is also within easy reach of the palm-tree seafront promenade of Larnaca. Should you wish to enjoy a live version of the traditional 'wedding march', an organist can be hired at a supplement. We are delighted to now be able to offer this very pretty church wedding venue in the eastern part of Cyprus. 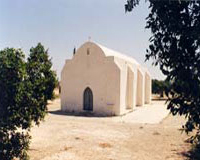 Located in Dherynia, a few minutes drive north-west of Paralimni, Aghios Constantinos Church could be the setting for your Anglican wedding ceremony. On your special day, we could arrange for flower garlands to adorn the church doorway and pretty candles could be placed by the entrance (supplement will apply for all decorations).